This relatively unspoilt and undiscovered town just ten miles north of Stow is a charming and engrossing place. The high street and much of the town were designated a conservation area in 1970 and the nearby gardens of Hidcote Manor and Kiftsgate Court, home of the biggest rose in England, are both outstanding. 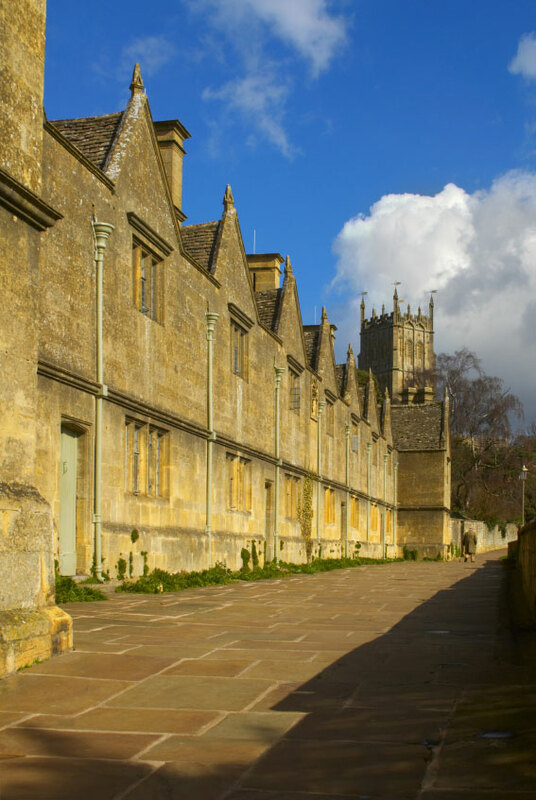 Chipping Campden forms the start of the Cotswold Way, a famous hundred mile stretch of footpath that runs all the way to Bath, and it is here that this famous footpath crosses with another famous trail, the Heart of England Way, which ends in Oxford. The Campden part of the town, which derives from the Saxon 'Campa-denu' or 'Campadene'- a valley with fields or enclosures of cultivated land - was already established in the 7th century. The Chipping part, however, deriving from the old English 'Ceping' or 'Market Place' - came later, when the town rose to dizzying heights of prosperity as the regional capital of the wool trade, for which it was famous throughout Europe. Many of the buildings in Chipping Campden date from this prosperous period, which took place between the 13th and 16th centuries. The 15th century Church of St James, for example, is perhaps the finest 'wool church' in the Cotswolds. Built on a grand scale it boasts a splendid 120 foot tower, spacious interior and one of the oldest (pre-Reformation) altar tapestries in the world. Each of the lime trees leading from the main entrance to the porch is supposed to represent one of the apostles and the church contains impressive statuesque brasses. The largest and most impressive of these is of William Grevel, measuring a hefty eight foot by four foot. William Grevel was one of the most important wool merchants in the country and financier to King Richard the second. What was once his house is now the oldest building in Chipping Campden, dating from around 1380, and would have been the first to have had chimneys instead of simply holes in the roof. Another important wool merchant who exerted a huge influence over the town was Sir Baptist Hicks (1557-1626) one-time Mayor of London and close friend of King Charles I. He acquired vast wealth through lending money to King James I and spent much of it on improving the town for its inhabitants. In 1627 he financed the building of Chipping Campden's famous Jacobean Market Hall, erected to offer shelter to those who made their living selling cheeses, poultry and butter. He also financed the building of a group of Almshouses which were and still are used as homes for twelve local pensioners. For himself he built Old Campden House, although this was burnt down during the Civil War by Royalists to prevent it falling into the hands of the enemy. Two gatehouses and an old stable block are all that survived. The town's elegant curving high street was described by English historian J.M.Trevelyan as 'The most beautiful village street now left on the island'. It offers, in the space of 100 metres, examples of Elizabethan, Georgian, Jacobean, Regency and Victorian architecture. 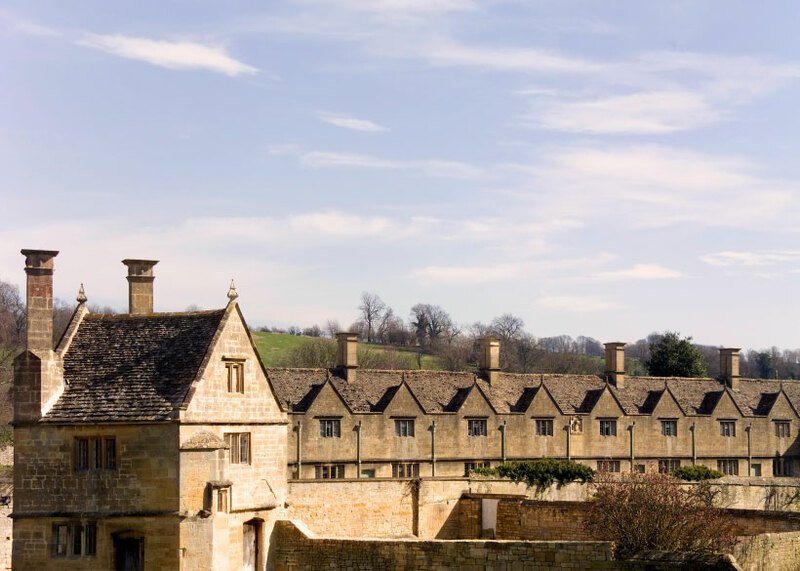 The twentieth century saw the town rise to fame once more as the centre for the Cotswold Arts and Crafts Movement. In 1902 Robert Ashbee moved to the town from the east end of London, bringing with him several members of his Guild and School of Handicraft. They specialised in metalworking and producing jewellery and enamels, hand-wrought copper, wrought ironwork and furniture. A number of artists and writers remained in the area, including F.L.Griggs, an etcher who built Dover's Court, one of the last significant Arts and Crafts houses. Today Dover's Court houses Court Barn, a museum of arts and crafts. Mr Griggs also helped to set up the Campden Trust, initially to protect Dover's Hill from development. Dover's Hill, overlooking the Vale of Evesham, is the jewel in Chipping Campden's crown. Forming a natural amphitheatre above the town it is the site of the Cotswold Olympics, which were founded in the 17th century by the hill's namesake, Captain Robert Dover. Initially following the traditions of ancient Greece, the games soon began to incorporate more down-to-earth events such as shin kicking and bare-knuckle boxing until hooliganism led to them being shut down in 1852. They were revived and given a modern makeover in 1951 and remain popular to this day, taking place annually, on the first Friday after spring bank holiday. They end with a huge bonfire and firework display followed by Morris dancing in the square.